Although I can't quite remember my reaction to hearing that the folks at Square Enix were working on a Final Fantasy-based rhythm game, I have a feeling it involved scrunched eyebrows and a puckered mouth. Well, after playing the finished product for more than 30 hours, I can say without hesitation that my initial skepticism was unwarranted. That's because Theatrhythm Final Fantasy is one of the most enjoyable--and most polished--rhythm games I've played in a long time. Like pretty much any game, this one features a few missteps--although in this case, they're fairly small ones. For starters, the opening and ending theme segments of the "Series" mode are a bit pointless. Also, that mode's "Event" stages--which task players with tapping to music while Final Fantasy FMV scenes run in the background--don't quite gel, if you will, with the "Battle" and "Field" stages. (That said, I consider the "Waltz for the Moon" event sequence to be a stand-out.) Finally, it has to be said that things are sure to become at least a tad (if not more so) repetitive after about the seven-hour mark, since that's when you start spending the bulk of your time in Theatrhythm's "Chaos Shrine" (in order to bolster the abilities and stats of your existing characters as well as to unlock a handful of "hidden" ones). I can't say I've minded playing certain tracks over and over again (in fact, in most instances it's the opposite), but I'm guessing that won't be true for everyone. 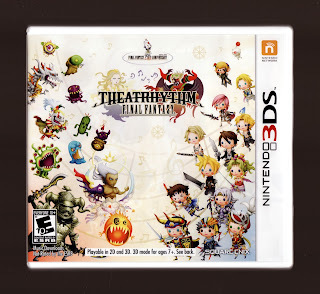 As long as you go into it knowing that--and as long as you have at least a passing interest in the Final Fantasy series--you should get a lot of enjoyment out of this melodious 3DS title. A masterpiece, no doubt. I'm really, really, really, enjoying it. Glad to hear you enjoyed it, Bryan! I have to admit that I wasn't wholly satisfied with the song selection, but it's a tough call when they have to pick and choose only a couple songs for each title. The unlockable songs add some enjoyment, but I do remember feeling a tad disappointed that none of my favorite FFVII and FFIX songs made it in to the series mode when I first loaded up the game. Also I find it difficult to get into the other FF music for games I haven't played before, like 1 & 2. 3 I've played a bit in the DS remake. 4 on DS I kinda started but didn't get much into it. 5 never played, 6 never played. 7 got 3/4 into it I think then got bored. 8 never played. 9 briefly played but never got back. X (and by extension X-2) I played and finished and loved. 11 annoyed the heck out of me as I felt it was a horrible MMO. 12 I think I got half way thru but the game bored me :( 13 I think 3/4 still need to finish. 14 - another MMO, once bitten twice shy. It's nice to know you liked it so much! Your recommendation means a lot to me, for sure. I'm still planning on getting this one eventually, but there are a lot of other games that are coming first. Hey, I think we've talked about this before, but are you on Steam? I'm playing a game called Breath of Death VII on there, and it's a sendup of 8-bit RPGs that I thought you'd enjoy. There's also one I bought but have not played called Cthulu Saves the World that's made by the same people. It looks to be the same kind of sendup, but of 16-bit RPGs. Yéti: Good to hear it! I'm really, really enjoying it myself. That said, I think I'm nearing the point when I'll move on to something else. The only 'secret' character left to unlock (well, the only one I care about) is Cosmos, and once I've got her I'm not sure how much I'll play anymore, as I'm getting to the point where I can't beat the Dark Notes anymore, and I'm unlikely to get any through StreetPass. That's OK, though, as I've spent about 40 hours with the game so far. Can't ask much more of a game these days, can you? I have a feeling I may have felt similarly to you in regards to the song selection if I had played a Final Fantasy other than The 4 Heroes of Light in the last few years. 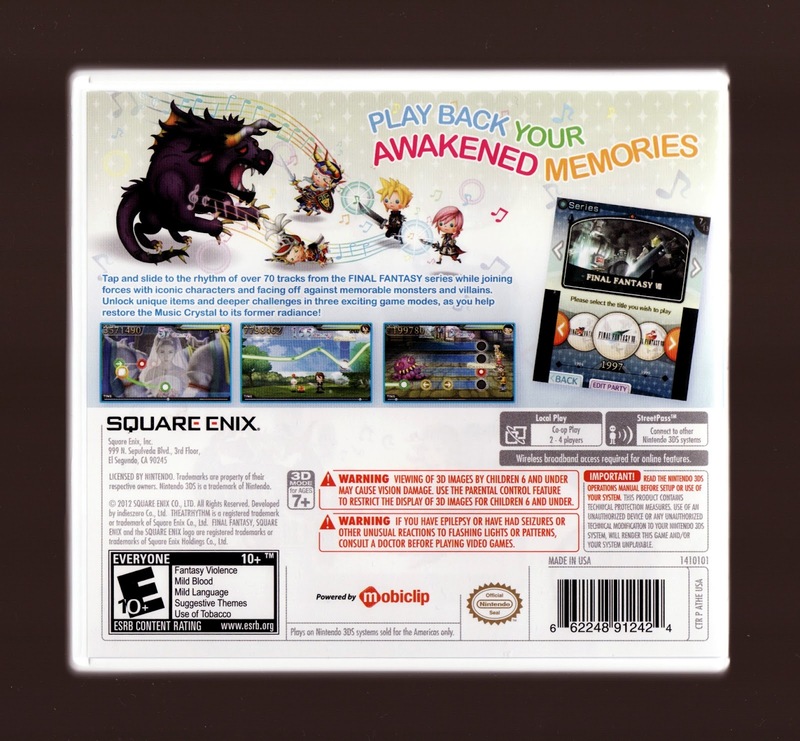 As it stands, my memory's actually kind of bad when it comes to which song appeared in which Final Fantasy, you know? Thanks for your suggestion, by the way. Honestly, I've been hemming and hawing about this for ages. I'm not sure why I've stuck with this "giant block of text" format as long as I have, really. I used it at first because the reviews were supposed to be short -- as in, just 10 or maybe 15 lines long (at most). Since then, they've gotten longer and longer. Maybe what I'll do is leave the really short ones as is and put breaks in the longer ones. It'll drive me nuts in a way (I can be a bit OCD when it comes to such things), but if it'll make the reviews more enjoyable and readable for you guys/gals it would be worth it. Igor: Oh, I can understand waiting for an XL! I'd do the same if I were planning to get an XL anytime soon. I think it would be so nice to see all of this on a bigger screen, for some reason. As for the Chaos Shrine being difficult: I agree, although in my specific experience I've generally found that sticking with new Dark Notes for a bit allows me to 'get' the rhythm and not only complete the Dark Note but master it after a while. This has worked until just yesterday, when I received a high-level Dark Note that I'm not sure I'll ever be able to beat. It's so fast it makes my head spin! Still, I'll stick with it and try to 'beat' it sooner or later. In regards to your comment about finding it difficult to get into the music from FFs you've never played: Well, that's going to be different for every person, I think. For me, I was amazed at how much I liked the music from some of the FFs I've never played (such as VIII and IX). In fact, I liked some of their tunes so much that now I'm determined to play the games they came from. That said, some folks are sure to have your experience -- where they're just not interested in music from FFs they've yet to play. Justin: I'll be interested to hear what you think of this one after you finally get and play it. I *think* you'll really like it, but it's really hard to say with a game like this. That said, I know all about Breath of Death VII. Not only that, but it's on XBLA, too. I've considered getting it, actually, but for some reason I haven't yet. A similar game that you may be interested in is Penny Arcade's Rain-Slick 3. I'm not at all sure it's on Steam yet (or if it'll ever be), but I have a feeling it will be at some point. Actually, I have Rain Slick 1 and 2 on my PS3. I started playing #1, and I'm not sure I love it. I might go back to playing it, though. I really doubt any 3DS game is going to top this one for me. A real love letter for those of us who have been playing Final Fantasy games for 15 (or more) years. I treied the from nintendo e-shop downloadable demo-version and I love it! But FF Thearythm and Kingdom Hearts 3D Dream Drop Distance are on top of my list!